1. In a saucepan, bring soy bean milk, agar agar powder and pandan leaves to a slow boil. Make sure you stir the mixture all the time until the agar agar dissolves. 2. Remove the pandan leaves and add in the sugar. Stir until the sugar dissolves. Taste and see if you like the amount of sweetness. 3. Add in the grass jelly. Pour the mixture in a tray or jelly mould of your choice. Chilled until firm before serving. When my grandma makes it for us when we were young, we always call this Michael Jackson Jelly! Your post reminds me of chedal,( I"m not sure how to spell it), a wonderful coconut drink with atap seeds and green jelly that we had in Singapore. We called the green jelly - green worms. I love the grass jelly and soya bean drink, the people in the market even renamed it to Michael Jackson drink when he passed away! Your dessert looks delicious. LOL@QUinn's remark on Jelly! Michael Jackon Jelly! 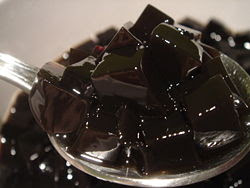 I like the grass jelly and used to eat plenty of them in summer. Really miss this. Hello, where do you get your pandan leaves? I also am a Msian living in the US - in DC! If I am not mistaken, you live in PA, so if you could tell me the name of the exact store where you can find pandan leaves, I will personally drive up there to get it. THANKS! P/S Also, if you've been to DC and know ANY store that has pandan leaves, please tell also! Thanks. This is so lovely. Perfect desert for the hot weather here now. I am going to ear mark this for trial soon. This black and white jelly looks delicious - I love grass jelly! This is exactly what I want right now in this scorching heat which is just unbearable! Michael Jackson combo! haha...Cheah is so funny! Frankly, I need some of these too. The weather has been extremely hot over here too, eventhough rains almost every evening. Hope you'll have a great weekend. This is really good for our hot weather here. I made this before but with barley water. Try adding some evaporated milk to the soy milk. It bring outs the soy milk flavour when made into agar based jellies. I never make mine without it and some people wonder mine just taste so different and lovely. Angie, we like grass jelly a lot too especially mixing it with can fruits. Catlover, you can get frozen pandan leaves at any Vietnamese grocery store. I am sure you can get it in DC too. Here in PA I got it from the Vietnamese supermarket 1st Orental between 6th street and Washington Ave, PA.
Angi, thanks for stopping by. I am sure you are going to love Malaysia. Cheah, oh the weather here is very warm too. Lucky it is not as humind as Malaysia. Kristy & Anncoo, yea summer is definitely here. It's 85'F here and I would love to have this refreshing and cooling agar-agar. yeah we had that one very hot day on tues i think...oy was it humid, i was not ready for that, but i did go swimming. do you have a pool? these candies are so cool. i adore your creativity. have a good holiday! i never see you around anymore....hope all is well. i must make this jelly too, weather here is really hot now, lovely combination. Sounds refreshing and looks great! Love the jelly moulds! Where did you buy them? Sonia, it is hot and humid here too. Anon, I got it from Malaysia. Wanna Be Chef, thanks for stopping by. Grass jelly and soy bean milk are both my favourite! A great recipe for summer! I was googling for agar agar and jelly recipes and found your blog. Love your photos and detailed recipes.